Now that you have the prerequisites completed, you can launch your Amazon Redshift cluster. The cluster that you are about to launch is live (and not running in a sandbox). You incur the standard Amazon Redshift usage fees for the cluster until you delete it. If you complete the tutorial described here in one sitting and delete the cluster when you are finished, the total charges are minimal. If you use IAM user credentials, ensure that the user has the necessary permissions to perform the cluster operations. For more information, go to Controlling Access to IAM Users in the Amazon Redshift Cluster Management Guide. In the main menu, select the region in which you want to create the cluster. 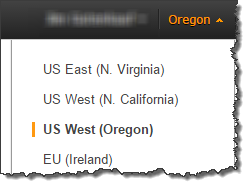 For the purposes of this tutorial, select US West (Oregon). 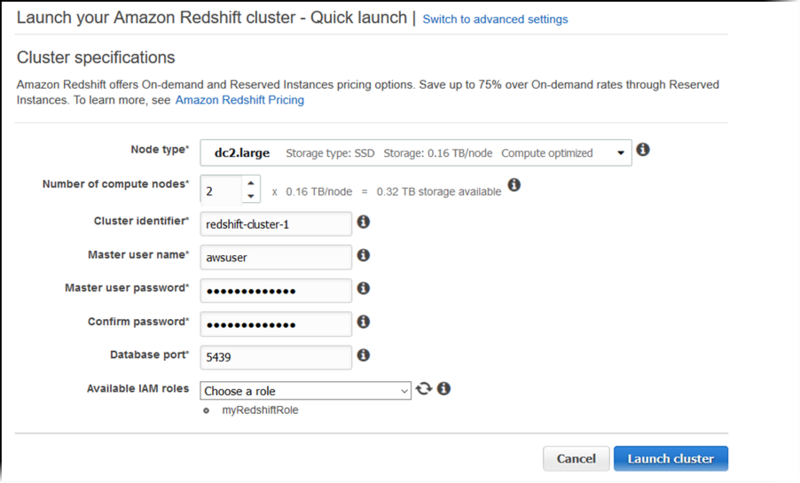 On the Amazon Redshift Dashboard, choose Quick launch cluster. The Amazon Redshift Dashboard looks similar to the following. Number of compute nodes: Keep the default value of 2. Cluster identifier: Accept the default value of redshift-cluster-1. Master user name: Keep the default value of awsuser. Master user password and Confirm password: Enter a password for the master user account. Database port: Accept the default value of 5439. Available IAM roles: Choose myRedshiftRole. Quick Launch automatically creates a default database named dev. Quick Launch uses the default virtual private cloud (VPC) for your region. If a default VPC doesn't exist, Quick Launch returns an error. If you don't have a default VPC, you can use the standard Launch Cluster wizard to use a different VPC or use EC2 Classic without a VPC. For more information, see Creating a Cluster by Using Launch Cluster. A confirmation page appears and the cluster takes a few minutes to finish. Choose Close to return to the list of clusters. On the Clusters page, choose the cluster that you just launched and review the Cluster Status information. Make sure that the Cluster Status is available and the Database Health is healthy before you try to connect to the database later in this tutorial.